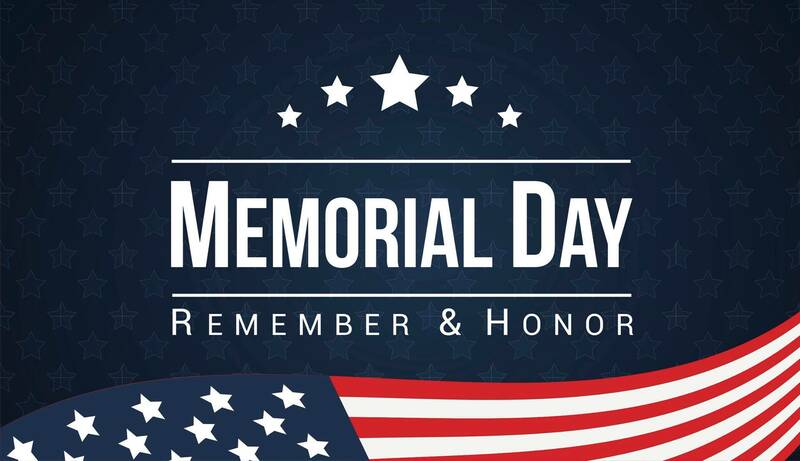 We spent this year’s Memorial Day with precious family. Our Plan A was to take a trip to the beach but due to an unusual Tropical Storm, we changed our plans and stayed close to home. 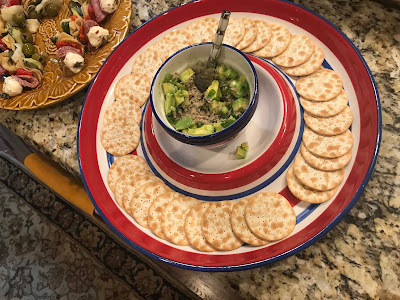 It ended up being a fabulous Plan B – boating, laughing, playing games and most importantly – spending time together (oh, and enjoying some amazing food as well!). My son and his fiancee brought some appetizers. Sprinkle pork with salt and pepper, and rub all over. 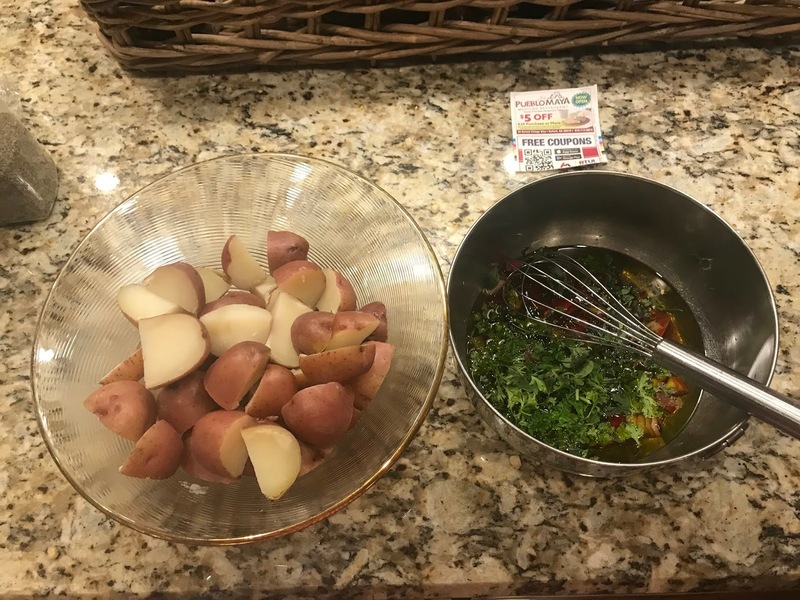 Let sit at room temperature 1 hour. Meanwhile, prepare a grill for medium heat and brush grate with oil. Brush pork with some preserves. 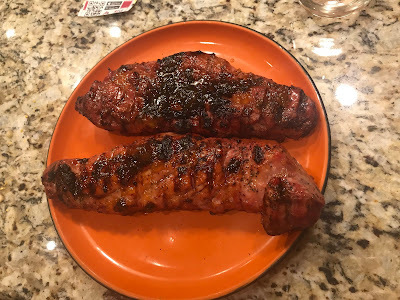 Grill, turning every 4 minutes or so and brushing with any remaining preserves, until charred on all sides and an instant-read thermometer inserted into the thickest part registers 130°, 10–12 minutes. Transfer to a cutting board and let rest 10 minutes. Slice ½” thick. 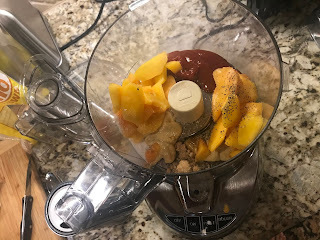 Serve sliced pork with Peach-Mustard Sauce on the side. 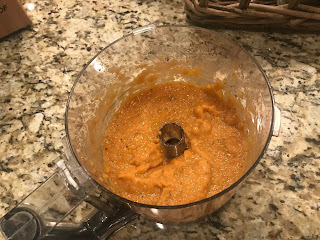 Purée peaches, ketchup, mustard, brown sugar, pepper, and ½ tsp. 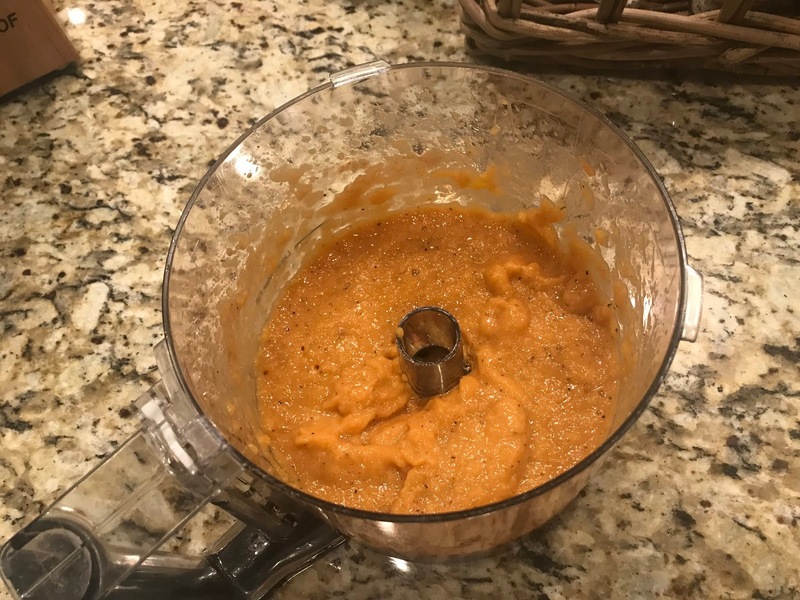 salt in a food processor until mixture is smooth and creamy. Taste sauce, and season with more salt if needed. 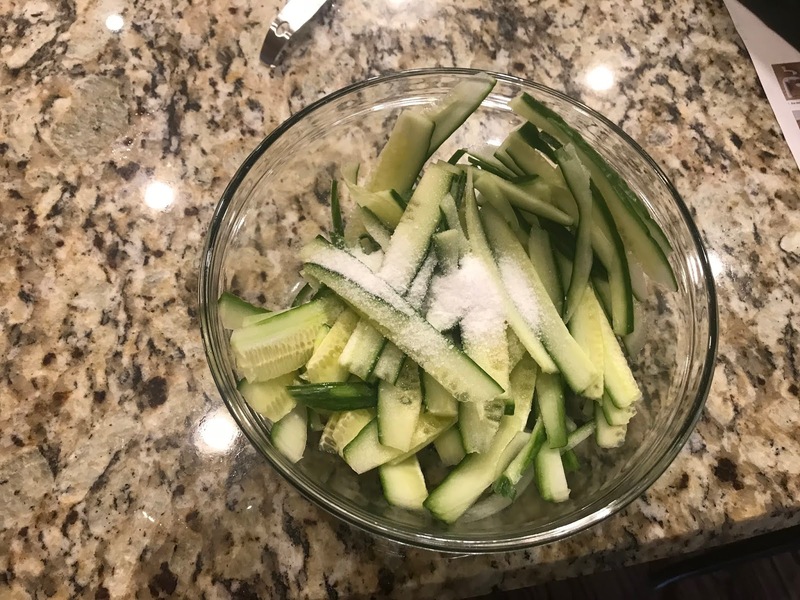 Toss cucumber and salt in a colander set over a bowl; let drain for 15 minutes. 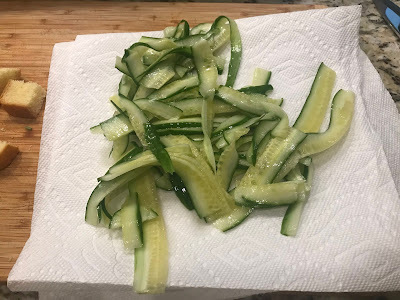 Spread cucumber onto paper towels and pat dry. 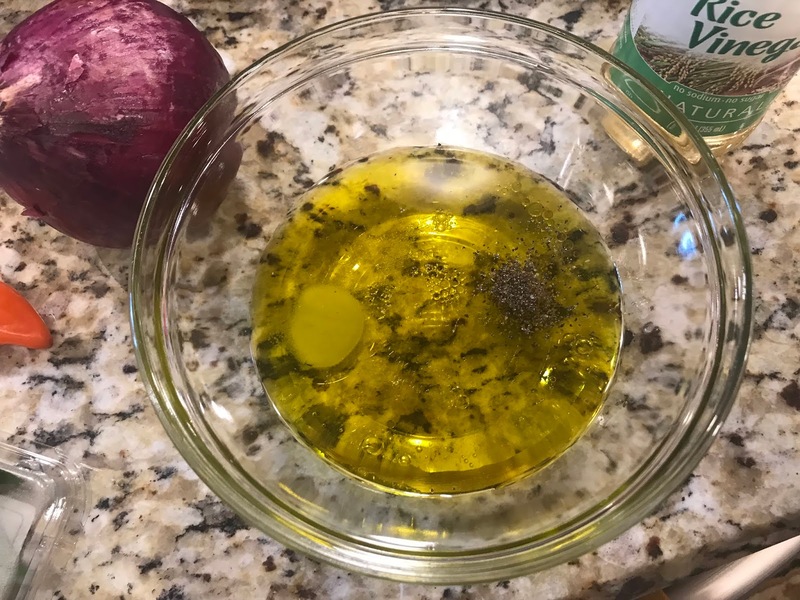 Whisk oil, vinegar, sugar, and pepper in a large bowl. 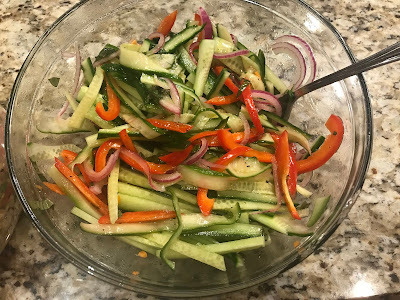 Add cucumbers, peppers, onion, feta, if using, and basil; toss to coat. Build a medium-hot fire in a charcoal grill, or heat a gas grill to high. 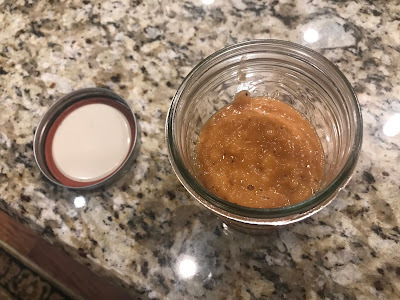 Rub corn with 1 TBSP oil. Grill, turning frequently, until corn is charred and heated through, 10-12 minutes. Remove from grill; when cool enough to handle, cut kernels from cobs and transfer to a large bowl. DO AHEAD: Corn can be made 3 hours ahead. Let stand at room temperature. 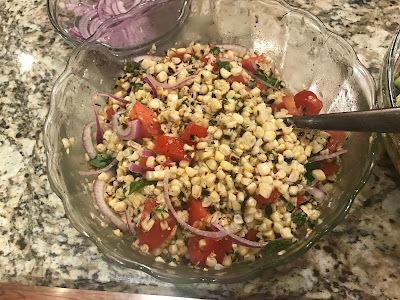 Mix onion, remaining 5 TBSP oil, tomatoes, basil, 1/3 cup lime juice, and thyme into corn. Season to taste with salt, pepper, and more lime juice, if desired. Heat a charcoal grill or set a gas grill to high; bank coals or turn burner off on one side. Using a fork, prick potatoes all over and wrap individually in foil; grill on the cooler section of grill, turning as needed, until tender, about 45 minutes. Unwrap and slice about ½” thick; transfer to a serving platter. Cut potatoes into even pieces and place in a large pot of bowling water. 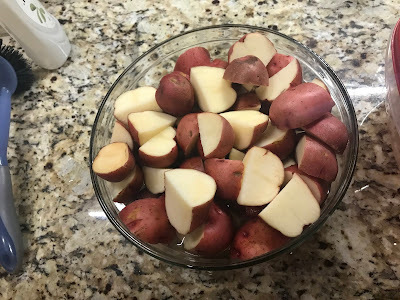 Boil roughly 10 minutes (or until soft when pricked with a fork – you don’t want them overdone). 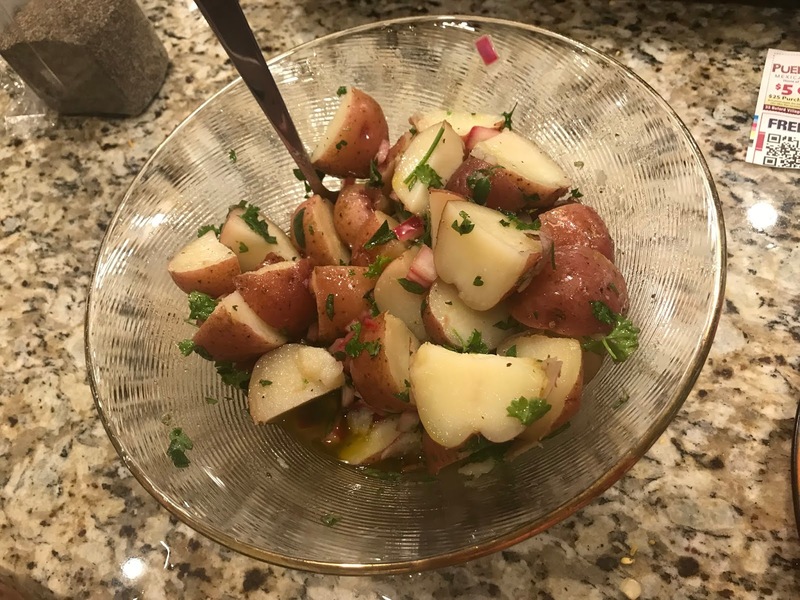 Whisk onions, oil, vinegar, parsley, oregano, salt, and pepper in a bowl; pour over potatoes. Serve warm. 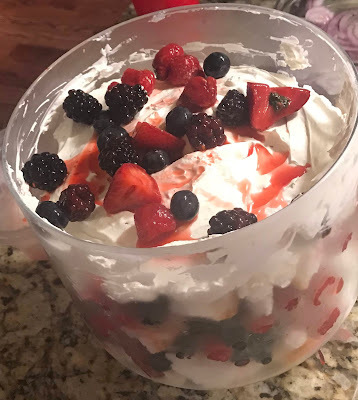 I’ve been preparing this trifle for years – it was my mother’s recipe, and you can use whatever fruit you like, but my daughter made this one and used red and blue fruit for the holiday. Layer a trifle bowl with a layer of angel food cake and sprinkle (if using) about 1 TBSP of rum. Top with a layer of whipped cream then some fruit. 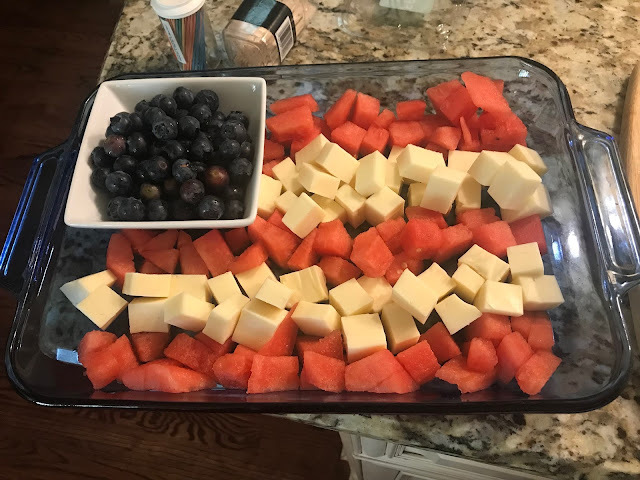 Layer 2 more times, ending with the fruit. Would be lovely with some cut up mint or basil too! Chill at least an hour for everything to set. DELICIOUS! My adult “kids” and their significant others stayed the night with us, so the next morning we had breakfast together before getting back to reality. This classic breakfast casserole is one of my favorites. So simple to put together the day before, then the next morning, simply pop it in the oven and you’ve got a fabulous breakfast that you didn’t have to work for in the early hours. Add a quick fruit salad and a cup of coffee, and your family will love you! 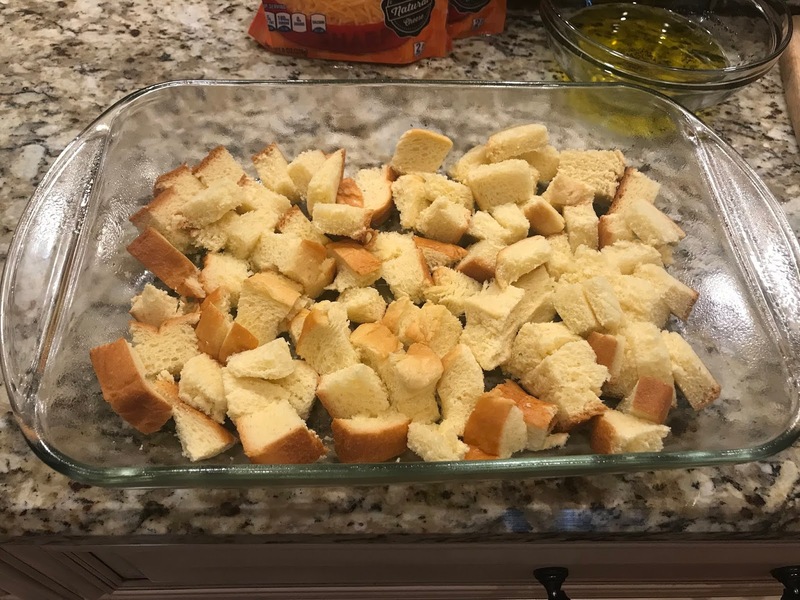 Cut the bread into 1-inch cubes and spread in the bottom of a greased (or sprayed with cooking spray) 9×13 casserole dish. 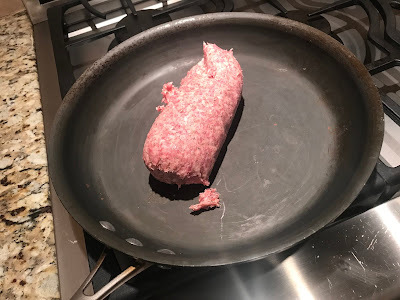 In a medium skillet, brown the sausage over medium heat until fully cooked and no longer pink. 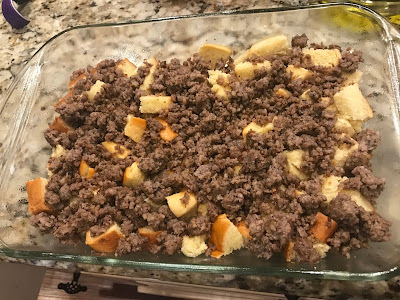 Remove the sausage with a slotted spoon to drain the fat. Spread the cooked sausage over the bread and top with the cheese. Then stir together the, half-and-half, dry mustard, salt and eggs. 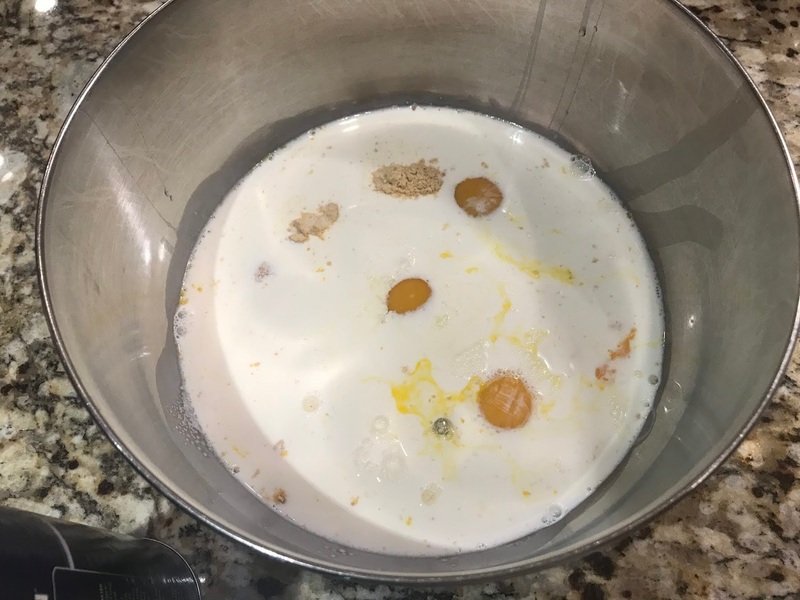 Pour this mixture over the cheese. 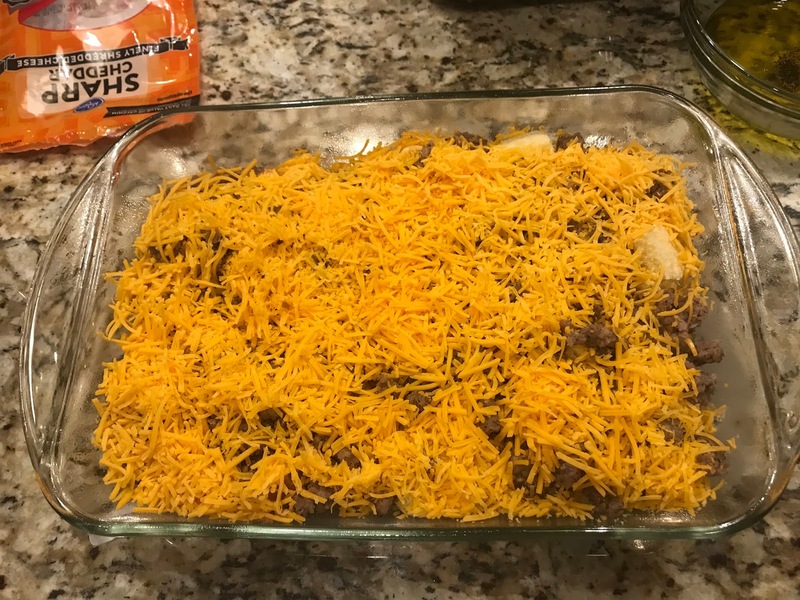 Cover the casserole with aluminum foil and refrigerate for 8 hours or overnight.